Can you not repeat that, please? 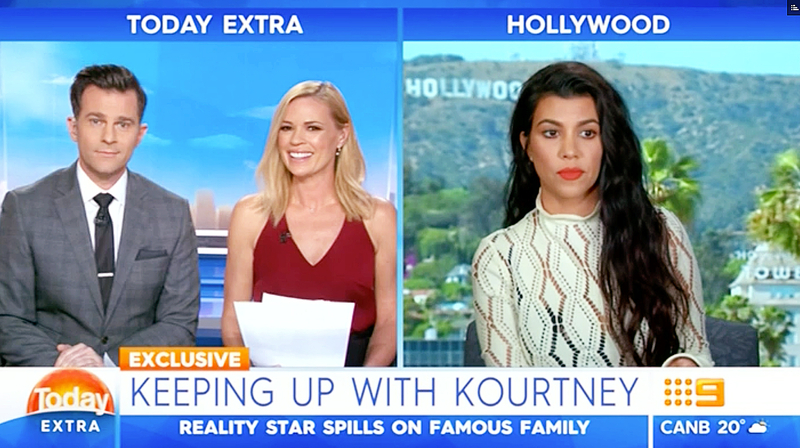 Kourtney Kardashian had a rough go-round when asked about sister Kim Kardashian&apos;s robbery scare during a live TV interview on Thursday, October 20. Watch what happened in the clip above. The Keeping Up With the Kardashians star, 37, spoke about motherhood and her workout regimen before Australia&apos;s Today Extra cohosts David Campbell and Sonia Kruger brought up the heavier topic. "You should know that the people of Australia and of our show were very empathetic about what happened and very horrified," Campbell said via satellite. "We were wondering, how is everyone doing, and how is Kim doing?" Kourtney nodded before looking at someone off-camera. "Um, what? OK," she said. Campbell interjected. "I’m sorry, is there someone talking to you?" he asked. Kourtney replied: "Yeah, sorry. They just came in." The reality star remained silent, and the network cut to commercial. "All right, it looks like Kourtney doesn’t really want to go there," Kruger told the viewers afterward. Campbell chimed in: "I think she’s blanking me. She’s totally blanking me on that question." Luckily, Kourtney eventually returned and blamed the issue on a bad connection. "Everyone was talking to me, but yeah, I mean, you know, she’s not doing great," she said of Kim, 35. "I think we’re all really still shaken up, and I just think she has a big, supportive family. And I know that all of the traumatic things that we’ve been through, we get through them together as a family, and that’s what family is all about." As previously reported, the Selfish author was robbed at gunpoint by a group of men disguised as policemen during Paris Fashion Week on October 3. The assailants stole more than $10 million worth of jewelry and remain at large. Kim is now safe at home in the States but was badly shaken by what happened. She continues to keep a low profile and has yet to make a public statement about the harrowing incident. Watch the awkward exchange in the video above.